Zürich’s Parade Square, better known as Paradeplatz, is located right outside of the main train station and is one of the city’s most important junctions. Not only do many of the tram lines meet up here, but Parade Square has made itself a name as one of the world’s big financial centers. Large Swiss banks have set up their headquarters here and thus, it has become a synonym for wealth and prosperity. 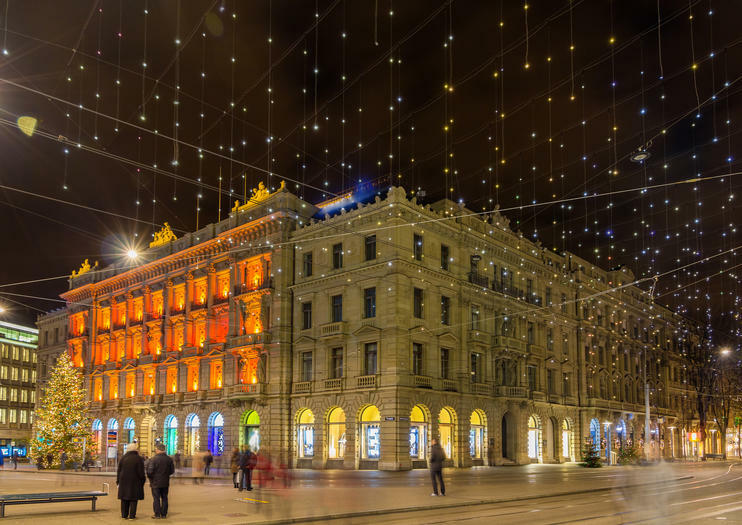 The square also connects to the Bahnhofstrasse, Zürich’s main shopping avenue where luxury labels fight over premiere retail space and the rich and famous come to shop. But Parade Square wasn’t always mentioned in the same sentence as wealth and its history stands in stark contrast with today’s prestigious reputation. In fact, in the 17th century, the square was an important market place for trading livestock, especially pigs. Thus, Parade Square was known as Säumärt – pig market – for the longest time until the upswing in business and its renaming. Located at Parade Square is also one of the city’s most popular confectionery manufacturers, the Confiserie Sprüngli. At this café meets chocolate store you can enjoy tarts, cakes and everything in between or pick up some delightful macaroons from a huge display making up all colors of the rainbow. Parade Square is located right in the center of Zürich next to the main train station. It is incredibly easy to get there, as many trains, trams and busses make a stop here. Homemade ice cream, hot chocolate, truffles and Swiss chocolate bars will all tempt your sweet tooth on this small-group walking tour. Stroll the atmospheric streets and cobblestone lanes of Altstadt, or Old Town, with a local guide — an expert in Zurich’s artisanal shops and the Swiss confections the country is famous for. Indulge in an array of tasty treats for a delightful afternoon. Numbers are limited to eight people for a more intimate experience. Take a chocolate walking tour of Zurich, and let your sweet tooth lead the way around the city’s artisan confectioners and chocolate producers. With a guide at your side, you’ll sample the signature Zurich sweet of Luxemburgerli, along with pralines and Champagne truffles. Learn about Swiss chocolate in the city, and check out some of the city’s landmarks such as the Grossmünster Church and Lindenhof. Switzerland is internationally known for beautiful landscapes, quality products such as exquisite watches and delicious chocolates as well as for its professional financial industry. Bankers are sometimes referred to as the gnomes of Zurich because they discretely manage the assets of their clients thanks to the legendary banking secrecy.Hear exciting stories about some of the most notorious clients (such as dictators, cheats and other criminals) of the gnomes of Zurich.The 90-minute walking tour takes you through the heart of the Swiss financial center. You will be accompanied by a very experienced compliance expert, who presents this topic in a compact and entertaining way.